As this is my first time contacting Turkotek, first things first: A Happy New Year filled with many blessings to All! My submission for your edification and amusement is this rug which I found at auction this past year. It's a Tekke, 41"× 53" , with asymmetric knots averaging 150/inch sq., open to the right. ( Please help me improve this improvised description. ) It also has a not uncommon alternation of light and dark blues on the diagonal in its primary guls. The photo may not pick it up, but there are four distinct shades of red in this rug--two different shades in the elems, with one shade at the top and another shade at the bottom, along with two obviously different shades of red in the field. Other colors include white, red-brown, natural brown, and the aforementioned two shades of blue. The selvege cords are all there and unbroken with bits of the blue overcasting still present--all thanks to the machine overcasting which I carefully removed after a very thorough but delicate washing when no bleeding occurred. What interests me are the secondary guls on this rug. Are they typical for this kind of weaving? If this rug appears on the horizontal in your viewing, the bottom of the rug is on the right. Please note the secondary guls which begin at the bottom where ones cut in half in the first row undergo changes which appear in the second row of full secondary guls, proceeding to a further change in the third row of full secondary guls. All subsequent rows of secondary guls appear essentially unchanged. A published example of a similar but not quite identical gul to the one in the second row of secondary guls on this rug appears in Amos Thatcher's Turkoman Rugs, Plate 14. I think that is enough from me about this rug. Without ever intending to do so, I have managed to acquire four small Tekke rugs, two of which are nearly square. More comment than previously, usually rather condescending, seems to have appeared in the literature in recent years about this genre of Tekkes. So I hope some of you all will find my submission worth your attention and encourage me to share others with you. The colors, border motifs, and gul geometry (squared-off major guls) and spacing of this piece all point toward an early 20th century origin. It is a loose but rather reliable rule for Turkmen work, that when the field designs appear crowded given the space available, it is likely a later piece. The minor gul motif on your rug is found on such pieces (small to medium rugs) frequently enough so that it cannot be considered rare. But it is not typical. The chemche gul is by far the more common motif, but guls like those on your rug are often seen. Yours is a bit unusual in that they are outlined with a diamond shaped line, which is uncommon, but for me, also points to a later date. This motif is also seen as an internal element of the "Salor" style turret guls found on some Tekke and Saryk work. Thanks for the informative analysis. I have one more question. Is it possible to determine whether at least some of the colors in this rug are synthetic or not? I have some other Turkmen pieces where the colors are likely from natural dyes. But the dating of this rug and the light hue of the field color make me suspect that at best this rug may have a mixture of both natural and synthetically dyed wools. Your assessment is correct, it is likely to be a mix of synthetics and perhaps a couple vegetal dyes, or possibly all synthetics. A couple medium range and closeup images in good light (not fluorescent, and not in bright high-contrast sunlight) woull be somewhat instructive. As our resident expert Pierre would explain, without a chemical analysis the answer can't be definitive. At some point I will try to show some more detailed photos of the colors in this rug. But I have one more comment and a request. Concerning the minor gul, the reference I gave from Thatcher shows a gul similar to the one in this rug as the only gul in a rather old juval, no dating given. Anyway, the juval's gul has a diamond around it. Thanks again for pointing out that the use of the minor gul in the rug shown here is fairly common in conjunction with a typical tekke main gul. So, if possible, can you please give me a reference in the literature--a photograph would be great. I looked through my sources, but couldn't find one. I am quite familiar with the common occurrence of the minor gul in my rug. Perhaps I misinterpreted your initial remarks. I had thought that you were saying that the occurrence of the minor gul in my rug, often found as part of a major gul in Salor pieces (Thatcher, Plate 5), as a minor gul in Saryq pieces (Thatcher, Plate 6), and as a major gul in Tekke pieces (Jourdan, Plate 69 and Thatcher, Plate 13), also commonly occurs as a minor gul in Tekke pieces in conjunction with the typical Tekke gul as shown in my rug. You commented in your earlier posting, "...guls like those on your rug are often seen." Well, yes! So I requested a reference for information which documents the occurrence of the minor gul in my rug with the typical Tekke gul in my rug. Your response, while providing a lovely photo of a Salor piece, really did not respond to my request. I hope that I have made myself clearer and look forward to your response. Next time you post remember to sign-in first, otherwise your post will not appear until Steve or I approve it. There are several currently for sale, all described as late 19th C to turn of the century. I bought this rug because of its color which I think is its main asset. However, I appreciate the input of others. The color in this piece is brighter than in the photo. Possibly natural dyes were used, at least for the red, because of the kind of abrash which occurs throughout the field and borders. The pink may have been obtained through the use of a mordant other than that for the main color. The closest comparable and accurate color I could find in the literature is in Grote-Hasenbalg, Plate 87. His comments about the red color in his plate still hold today and are relevent to the rug in my photo. It's tough to judge the colors in this image; I can't really distinguish between orange and pink - it seems to be a flash photo with a lot of contrast. Maybe a few closer views would be helpful. That said, such colors, and the basic appearance, appear (to me) to be more characteristic of commercial early 20th century pieces. I don't have a copy of Grote-Hasenbalg; maybe a scan of a photo of the plate woul dbe helpful. Well, I think you are spot on about the dating of this rug. From plates in Jourdan as well as Grote-Hasenbalg and other sources I would place its weaving right around 1900 or after. By the 1920s elements start disappearing from the guls and the presence of synthetics is even more frequent. My comments about abrash in this rug reflect those of Jon Thompson about abrash on p.62 in his Oriental Carpets (1988). No flash was used for my photo, and there is no orange in this rug. The colors are fairly adequately represented with little exaggerated contrast. To be frank, I don't think this rug deserves more photos. It is, as you pointed out, a typical commercial product as most of the Tekke rugs of this period were. Thankfully, I have but one more small rug to share, and I think you all will find it interesting. It may even precede or at least come early in the enormous commercial output exemplified by my first two offerings. This small Tekke rug is 41"×46", and has 180 undepressed KPSI with a ratio of 1h:1.8v. All dyes are apparently natural. An apricot color used only on the bottom elem is somewhat faded from front to back; the other dyes are relatively unfaded. The pile is glossy, and the rug has a floppy handle as did the second rug I submitted. But unlike the second rug, which was very thin with 150 KPSI, this rug with its higher knot count also has a significantly deeper pile. I cannot find another example of a Tekke rug with this rug's main border and hope that other members can suggest possibilities for its origin. Would you mind posting a few close-ups, one including a corner with ends and borders detailed ? And one of the back close enough to judge the weave ? Yes, I will do that in the near future. Right now we are in the midst of a blizzard which has dropped in excess of 15" of snow on top of 36" + on the ground. The new drifts are mounting over five feet, and I need to get firewood from the barn. I am looking forward to your close-ups. I hope one or two show the backs, especially of the rug you posted first. The main field color, which looks almost salmon to me, seems quite unusual, unless we are speaking of very late pieces, or knock-offs, such as came from Pakistan in the mid-20th century. 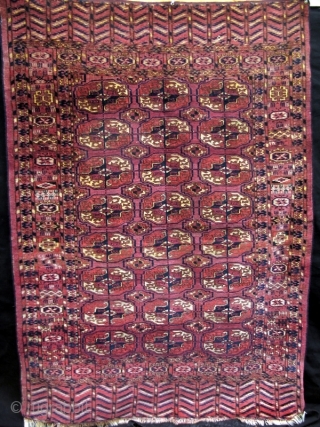 Our computer screens have a way of homogenizing the appearance of many colors and textures in rugs, especially red Turkoman examples. Good quality close-ups, close enough to show detail but long enough to show context, sometimes help us to figure out more about the rug. Regarding the use of simplified and miniaturized versions of the standard quartered gul in the minor position, there are a few examples we would consider pretty old shown in Turkmen, edited by Mackie and Thompson (1980). If you have access to it, see Plates 4, 5, 6, 7 (Salor); 16, 18 (Saryk); 28 (Tekke). As to Plate 14 in Thacher, I note it is one of those examples in which the field is divided into smaller rectangular spaces, each typically holding some version of the gul. I view them as something unto themselves in terms of judging the choice of gul type in comparison with other bags. Below are posted photos of my latest submission about which I am seeking information concerning the main border. These photos include both a front and back view of one of the intact corners of this rug. The very fine white wool yarn of the warp is z-spun as nearly as I can make out and s-plied with two strands -- no surprises here. At some point I will send photos of the back of my first submission. It is of some interest, though I think Chuck's comments with my few additions pretty much cover what is there.